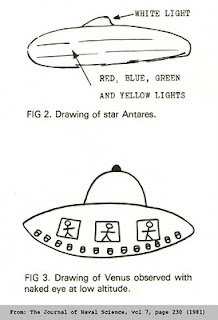 The October 1981 issue of the semi-academic Journal of Naval Science departed from its usual subject-matter of Cold War tactics and technology with an article entitled "UFOs - Evidence of Alien Visitation?". The paper was written by Geoff Kirby, who at the time was a superintendent at the Admiralty Underwater Weapons Establishment on Portland. 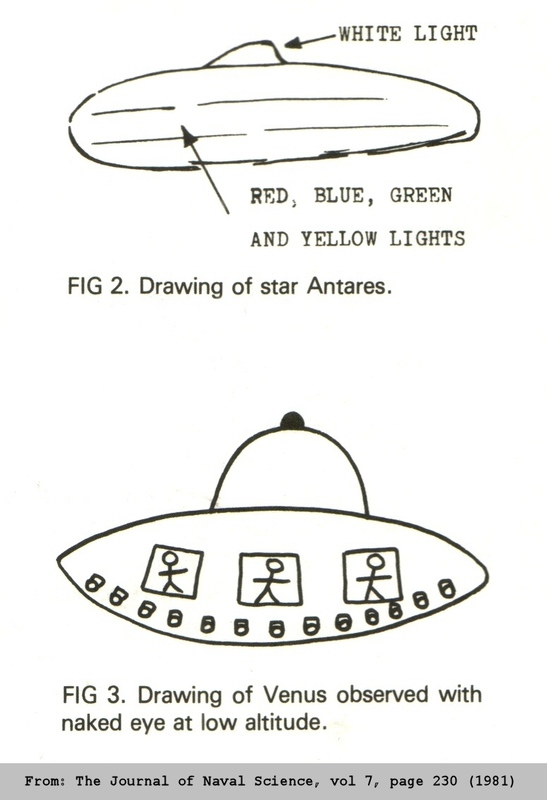 It provides an excellent summary of the state of ufology at the time, discussing the observational facts (witness statements, radar evidence, physical traces) and taking an "Occam's Razor" approach to the most likely explanations of these facts (an amusing example of which is illustrated on the left!). At the end of the article, which is caveated with a statement that it "does not in any way claim to represent Ministry of Defence policy on UFOs", Geoff concludes that "after more than three decades of searching there is still no definite proof that alien spacecraft are visiting the earth". At the time of its publication, the Journal of Naval Science had a restricted circulation within the defence industry, but Geoff has confirmed to me that he was given permission by the editor at the time to publicize this particular paper however he wanted (and Geoff has graciously consented to this blog post!). How does one obtain this article?